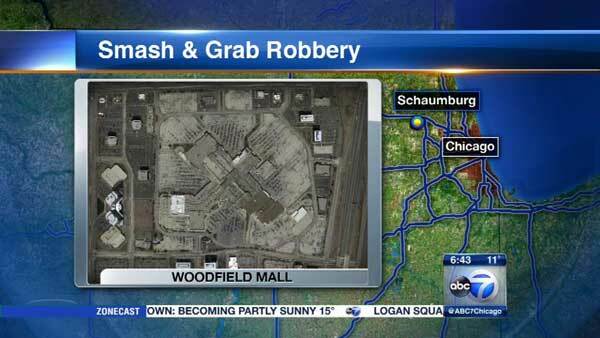 SCHAUMBURG, Ill. (WLS) -- Schaumburg police are investigating a brazen smash and grab robbery near Woodfield Mall in the northwest suburbs. Authorities said two thieves went to the Jared Galleria of Jewelry store around 8 p.m. Tuesday - while it was open - smashed two display cases with hammers and ran off with what they could grab. The suspects made off with 63 loose diamonds worth $427,225, loose and semi-mounted gem stones and other pieces of jewelry. Police say the suspects fled the scene in a minivan which was later found unoccupied in a nearby parking lot. The investigation revealed the van had been reported as stolen from Rolling Meadows. Schaumburg police released this surveillance image of one of the suspects in a brazen smash-and-grab robbery at the Jared Galleria of Jewelry. Schaumburg police released this surveillance photo of one of the suspects. Investigators released a surveillance photo of one of the suspects, and are working on detailed descriptions of the thieves.